Yes, you could put these kids through school. And never even hear about it. You just have to trust me. Granted, this was taken in 2003, so these kids are probably done with school now… but you could fund their kids.. possibly. Now that I have your attention. Say it’s the end of the year, as it is, and say you have a little bit leftover this year, as you might. You’re looking for a good place to make a kind donation. May I suggest that you consider a donation to Friends of Guatemala. Your contribution will provide scholarships for students in Guatemala. 100% of it will go directly to funding students. You give $127, kids get $127. The only catch is you’ll get no letter in the mail asking you to send more. You’ll never know who the kid is that got the cash. They don’t have a website with cute pictures of the kids going to school with little uniforms and backpacks (see image at right). They’ll never send you a newsletter that you’ll never look at. They don’t spend money to do any impact reports highlighting all of the good things they’ve done. The only thing you’ll get is an acknowledgement of your donation for your taxes. It’s like the Fight Club of charities. In fact, you may feel like you’re throwing your money in a hole. But speaking from experience, you’re not. I can attest, I have been throwing money in this hole for years and now my friend’s kid is studying in Florida on a scholarship. Does this sound appealing to you yet? If it does, please consider a contribution to the Friends of Guatemala (Link to their Guidestar profile – but you won’t see much. No overhead, hence no money for reporting too much.). 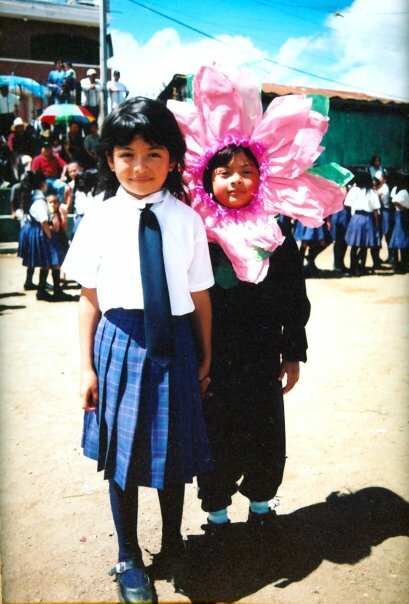 It’s run by returned Peace Corps volunteers who just shuffle the money back and forth and send out the letters, but everything you give, all of it, every bit goes to fund promising students in Guatemala. You can also find them on Facebook page if you want to like them. If you’d rather have the normal giving experience where people send a letter, tell you that you’ve done great and show you pictures of the good things you’ve helped them do, then I suggest you look here: Food4Farmers, Coffee Trust, Pueblo a Pueblo. These folks are also doing great things and are totally worth your while.